I’ve been looking toward the United States a lot lately. Actually, Marilyn and I both have. There are things that we’re starting to miss. Yesterday I wrote about my craving for fútbol americana. 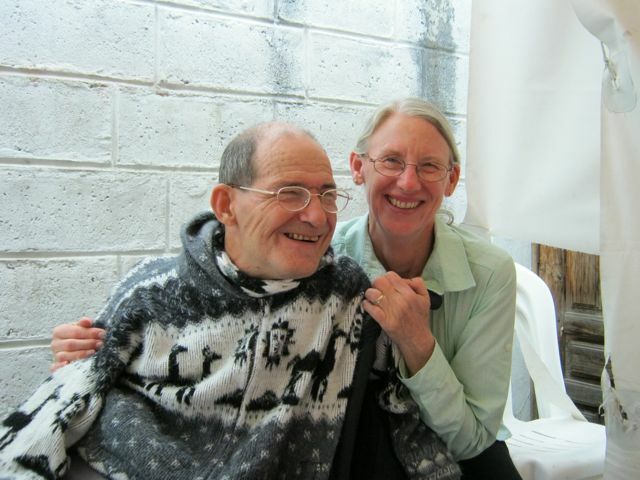 Day before yesterday Marilyn discovered she couldn’t find any peanut butter in the largest grocery store in Otavalo. We have been concerned about friends who went through tropical storm Hermine. We have both craved a good coffee cake on a Saturday morning. My thoughts are also drawn to the U.S. because today is the ninth anniversary of the most horrific event I have witnessed in my 61+ years of living. I remember exactly where I was on 9/11. I remember watching TV as the second plane appeared to come from nowhere and plow into the second World Trade Center tower. It was then that no one had further doubts as to what was happening. I remember watching one, and then the other tower collapse and crumble upon itself. I remember breaking down and shedding tears of utter grief at such inhumanity. I remember commenting to Marilyn that our world had been changed forever. And it has. There is more suspicion. There is more hate. There are deeper divisions, from the U. S. Congress, to various religious faiths. There is more need for security, from airports to drinking water supplies. Even in Ecuador, seemingly far from the battle with extremists that was joined on September 11, 2001, one cannot enter the airport in Quito to see a relative or friend off. There is less cooperation, caring, and respect between nations, between cultures, between religions, between a lot of individuals. The world has changed, and I can’t say it’s for the better. After 9/11, say what you will about him, George W. Bush took great pains to keep religious factions from descending into an us-versus-them mentality. Where is a George W. Bush now? After 9/11, George W. Bush took great pains to point out that the hijackers had hijacked Islam and were in no way sanctioned by Islam, as peaceful a religion as Christianity. Where is a W. now? I watch from afar as controversy rages over whether or not to build a mosque two blocks from Ground 0. I watch and am aghast that republicans stoke the controversy in order to curry political favor. This is New York. New York was one of the thirteen founding colonies of our nation. History books taught me that our nation was founded on religious freedom – the right to worship however you want whenever you want on private property. Has that notion gone by the wayside? I’m not sure if the constitution spells it out, but I’m sure that there’s at least an understanding that worship should also not harm the public. In my view, a mosque two blocks from Ground 0 would not harm the public. Would there be a controversy if a church were being built on that spot? No? Wouldn’t it be the exact opposite situation, since I understand that many Islamists died in that tragedy? (Whoops. There go my Christian friends.) Oh, you say it’s different because Christians didn’t fly those plane-bombs. Well, neither did Islamists. They were radicals, not true believers. Do you know of any Christian extremists? Would you call them true believers? Today I read an article about a preacher in Florida wanting to hold a Quran-burning. That’s pretty extreme, if you ask me, and I would argue that his faith is woefully misplaced. It’s also as offensive to me as burning the Bible, or burning our flag. When I was a youngster in school, I remember how everyone in the class would get punished because the teacher couldn’t find out who was at fault for doing something against the rules, or against her principles. Do we really want to live with that kind of mentality? Do we really want to shun entire religions or groups of people because of the actions of extremists within their ranks? If we do, you might as well discount me right now, because there are some pretty radical people with disabilities out there. And I might as well cross you off because I’m certain I could find an extremist in one of the groups you belong to. Here we are nine years later, without a W. to calm the nation and tell it to get a grip on itself. Here we are with animosities so deep it’s heart wrenching, scary, and laughable all at once. What will the 10th anniversary bring, aside from flag-waving, speeches, and photo-ops? Please let us be able to say that our world is closer to peace than it is today. As I look around, I see bleak prospects for cooperation and understanding and respect. Without that tripod of values, can our freedom continue to endure? P.S. Reading over this post, I realize I didn’t say anything that might want to make my Islamist friends desert me. That was not by design, but maybe it was subconscious. Maybe they need a break more than most groups right now. Are you ready for some football!!!? (I love that line by Hank Williams, Jr.) I’m ready! But I’m down here in Ecuador. All they have is fútbol (soccer). And I have unreliable and expensive internet service. What’s a body to do!? Especially one that thrives watching fútbol americana? Of course, fútbol is a great game, or so millions and billions of people claim. I got caught up in the World Cup this year because, even though Ecuador didn’t make the cut, EVERYBODY in Ecuador watched the games, unless there was something urgently pressing, like a fire in the building. I even learned a lot of the rules, and some of the strategies. After a month of nonstop fútbol…, I was bored. Even when I sided with people who picked the winner in the final, and had cause to celebrate…, I was bored. Give me fútbol americana any day. Please. 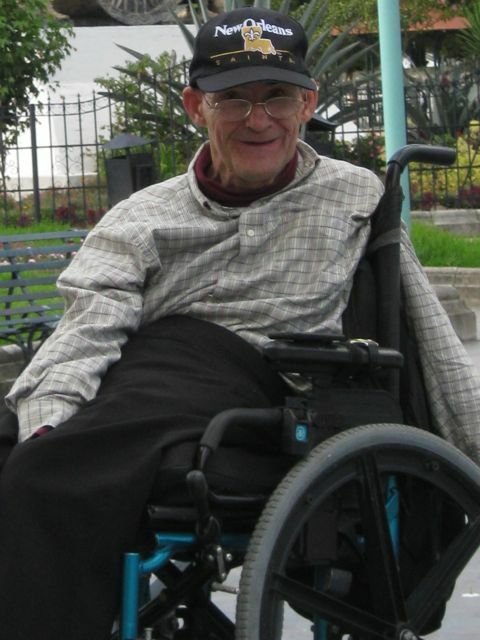 Months ago, I met a man from the U.S. who is now living in Quito. (If you’re ever in Quito, by the way, stop at Confederate Books, the store he owns specializing in English language books.) He told me there were bars in Quito that showed fútbol americana. However, not long ago he wrote and said that it would be “problematic” this season because Ecuador passed a law closing the bars on Sundays. That possibility was thus shut down, though I had never seriously considered asking Marilyn to drive me the two hours to Quito every week for Sunday afternoon football games. After all, she’s doing the missionary work down here. I’m merely her assistant. I thought about watching games over the Internet. It’s mostly free on ESPN for college games, and you can buy a package for NFL games from nfl.com. However, as I mentioned, my internet service is, in a word, road kill. Okay, it’s two words if you’re not living in Texas, which I’m obviously not doing. The best solution I’ve found is a USB modem from PORTA, the largest cell phone company in Ecuador. However, I pay $32/month for only 2,000 MBs of traffic each month. Luckily, the application has a counter, so you can track the volume of your internet traffic. Two thousand MBs a month sounds like a lot. Ever watch how many MBs you’re using when you watch streaming videos? It’s like watching an electric meter on a house that has two two-ton air conditioners on a day when the temperature is 110 – the money just flies away. So I knew watching games via the Internet was out of the question. very often here, but I wear it with pride! But I figured, “Aha! Audio won’t use nearly as much bandwidth as video.” Yesterday I shelled out $40 for a season audio package from nfl.com before the first of my beloved New Orleans Saints games and prepared to listen to the Saints hometown announcers. By watching the counter, I soon calculated that, if I listened to the entire game, I’d use up all the MBs allowed during the current monthly billing period (which only started three days ago), and we’d be without the Internet until October 7, unless we wanted to pay at the rate of $3/day. Marilyn would not be a happy camper. Besides, as often happens, I kept losing the Internet connection, which forced me to reboot my computer. The audio idea fizzled. I didn’t try to get my money back because there are times when the hotel’s wireless connection is working fine and I could use it to listen to a game. I justify that by saying that going to a single game, by myself, would cost way more than $40. Is that justification or rationalization? That left my fallback plan. Both ESPN and the NFL have sites I call graphical sites. They show a football field and use various colored arrows and symbols to indicate what’s happened on the field. They also provide a short summary of what happens on each play. It’s definitely behind watching streaming video or listening to streaming audio as far as satisfaction is concerned, but, hey, it’s better than waiting to read a report of the game after the fact. It’s especially so when you’re craving fútbol americana instead of plain vanilla fútbol. That’s how I watched my Saints eke out their win over the Minnesota Vikings last night. And that’s how I’ll follow the LSU Tigers, Texas Longhorns, U. of I. Illini, and the rest of the New Orleans Saints games – graphically. Of course, I write this tongue-in-cheek. There are problems much more serious here than not being able to watch fútbol americana, like having clean drinking water, or being able to afford sending children to school, or having adequate shelter. Still, I see many big-screen TVs around. They just don’t know what to put on them. Missionaries are not expected to change the world. Their impact may contribute to the wellbeing of some individuals or of some communities. At times they make huge impacts like Mother Teresa; at other times, their impact is much smaller. I know and understand all of this, but sometimes...well, maybe a lot of times, I wonder what I’m really accomplishing here. I suspect I’m a pretty average teacher of English. My understanding of the spoken Spanish vocabulary I’ve learned in the past has gotten better, but I still can’t understand many conversations (and I’m not so great at explaining concepts of grammar or even giving simple commands like “listen” or “sit down” or “clap your hands” with accuracy in my English classes). I probably don’t pray often enough and I know my daily reading of the Bible consists only of reading a daily devotional I receive over the Internet that includes a short passage from the Bible. I do care about people and I try to share what “gifts” I have. So, does that make me a missionary? Really? Then, every once in awhile I get glimpses of some little impact I might have made. A week or two ago, when our car, Molly, wasn’t starting so well on cold mornings, I took the bus to Caluquí to teach my English pre-school class. The students have gotten used to my coming, making me no longer this unusual occurrence that causes them to pay much attention. That particular day, only half of the students were actually following along; it was the day I decided I needed to be more proactive in getting their attention as we explored this new language for them. This latter plan filled my thoughts as I walked the 20 minutes back down to the highway where I could catch the bus. About half way, I passed a mother, her child, and an older child that seemed to be a friend. I recognized the preschooler immediately as one of my students and miraculously remembered his name. (I still don’t know the names of all 30 students in my class.) I said “¡Buenos dias!” to the woman and then, “Good morning, Juan David!” He returned the greeting with “Gud mourning, teecher”. His mother beamed with pride. Here, knowing English is perceived as a way to get a better job or a way to bring in more income. Obviously, Juan David’s mother was proud that her son had started learning English in his pre-school class. their hands after they finish painting. 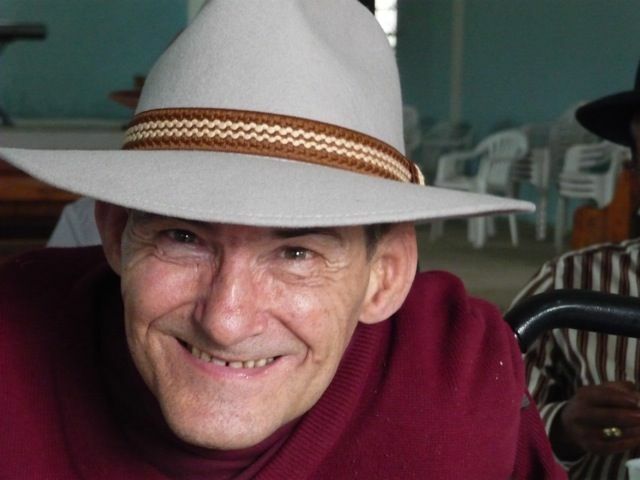 Later that same week, I met with, along with Marlena of FEDICE's staff, Agustine, the pastor of the church in Cachimuel, and a small number of his parishioners at their church. Marlena and I were signing up students for English classes that I will begin teaching next week. This church has a wonderful welcoming spirit that the group from Austin experienced last July when they came to help build a new second story room to be used for children’s activities. Discussion also took place about the times classes would be, on what days, etc. I will again be teaching an adolescent class and a teen class. Then there was some jovial encouraging that I initiated, trying to get the adults to take an English class. Before long, it was decided that I would teach from 3:00 to 6:00 p.m. on Tuesdays and Thursdays, including an adult class and a “homework help” period. I left feeling very excited about this new teaching situation. There was eagerness in the eyes of both the parents and the children as they filled in their applications for the classes. 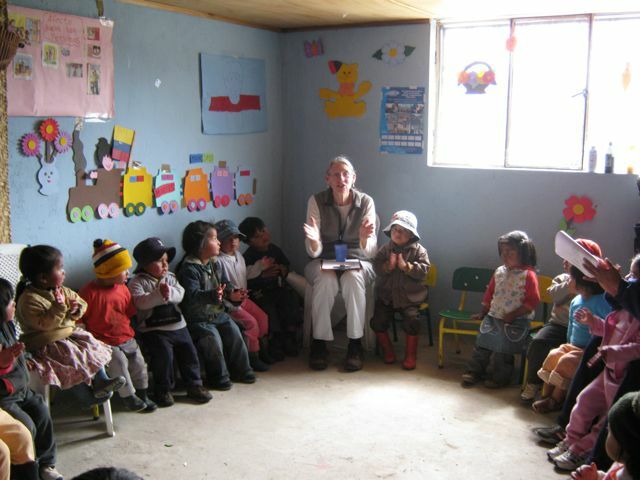 In this location, it is expected that my students are there because they want to learn, not because someone has said that learning English is a good idea for the future and has made them come to the class. And I really enjoy teaching adults! Sometimes adults forget that they can still learn, as often school learning situations have evaporated. That afternoon, I felt a glimpse of what I might help my students accomplish in their futures. 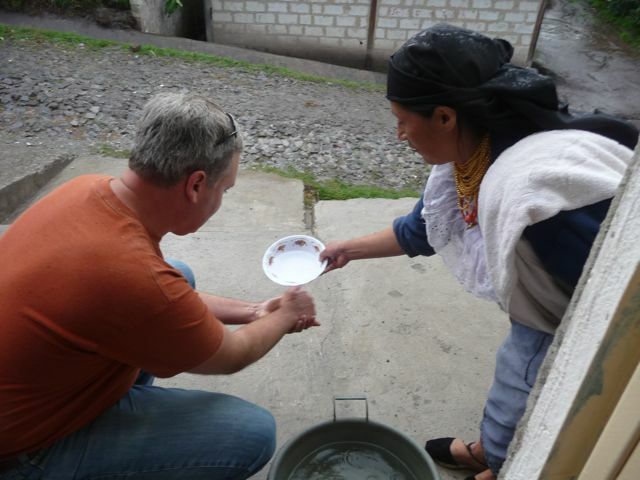 What I do in Ecuador is what many individuals do in their hometowns. One smile, one handshake, one welcome at a time is what I share with others. Maybe a difference is that I have chosen to live nearer the poor, and that offers me opportunities to get to know them and to better assist where I can. I hope my smiles and handshakes and welcomes are reflections of God’s spirit of giving. 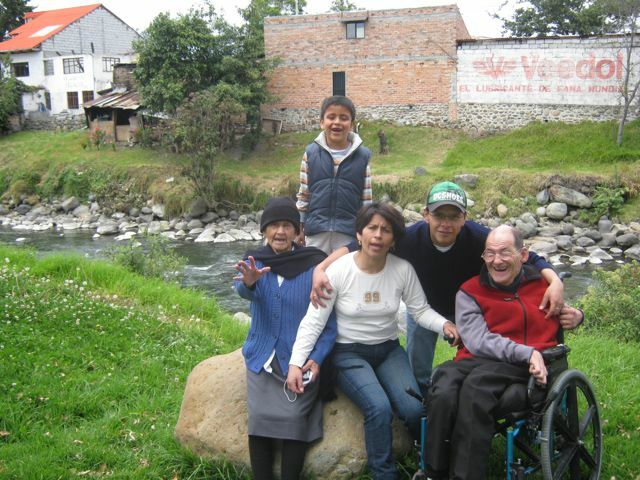 Last week, we took Isabel and her family to Cuenca, a 13+ hour drive best done over 2 days, for a vacation. 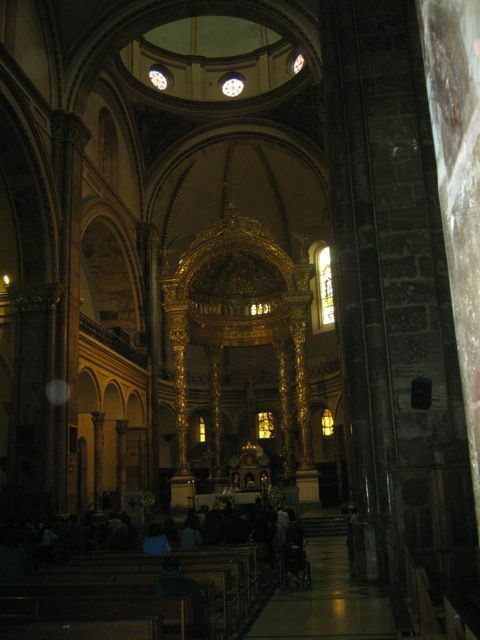 They had never seen the city and her mother, Victoria, wanted to see the cathedrals before she died. 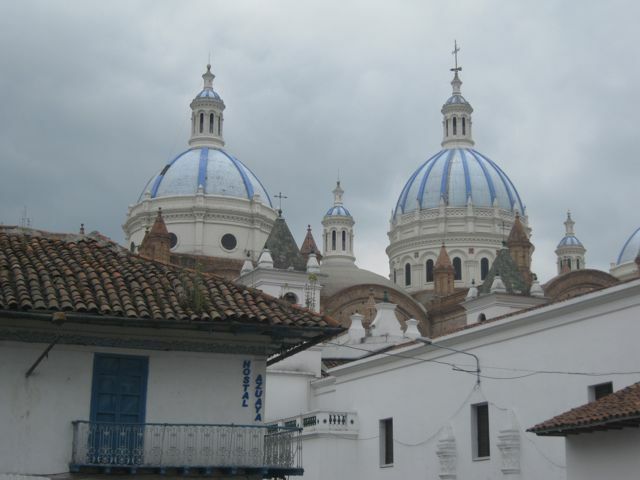 Cuenca is said to be the most beautiful city in Ecuador. Victoria is 86 years old and has cancer so death is something she faces more immediately than many of us. On the way back, all of us cramped in the car after many hours, I asked what people enjoyed most about the trip. Glenn mentioned that seeing Victoria walk up the center aisle for communion, as well as kneel in the pew for prayer in the grand cathedral in which we attended service on Sunday morning, was one of his high points. 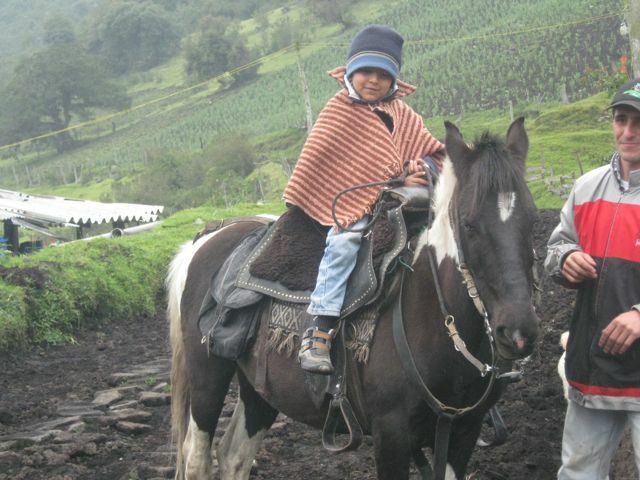 Eight year old Brayan liked his first horseback ride, which took him up into the cloud forest in the mountains near Riobamba as his favorite thing...oh yes, and all of the food! 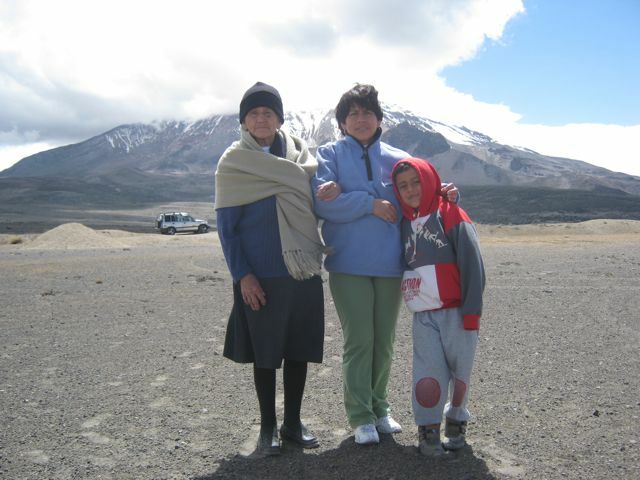 Victoria said her favorite things were seeing Cuenca and the wild animals on the mountainsides of Volcán Chimborazo, the tallest volcano in Ecuador and earth’s closest point to the sun. 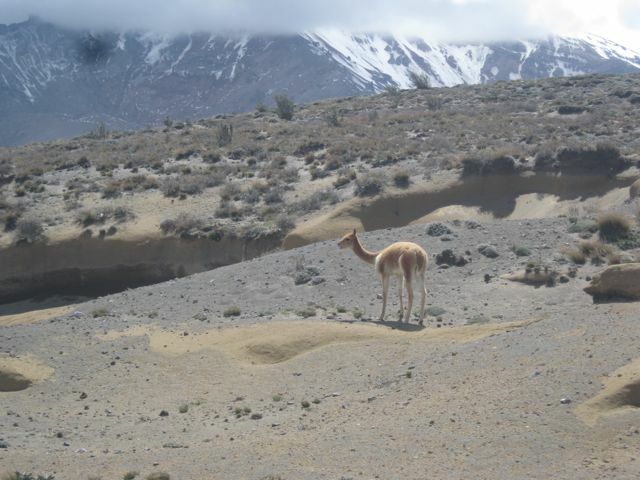 She is sight impaired and the vicuñas let us get somewhat close as they grazed on the very short vegetation of the paramo (a desert-like landscape with little vegetation). Isabel said that she liked all of the week. And I especially liked that Elvis, Isabel’s 22 year old son, was able to join us for the weekend so the whole family could enjoy part of the vacation together. So, there you have it: another small glimpse into the life of one trying to spread goodness and love. It’s probably not so different from what many of you are already doing; I’m just doing it in what may appear to be an exotic place. All of you, please keep up the good work.